Hannah and Eric are finally married and I could not be more excited for them! The week before their wedding day was however filled with lots of stress with the announcement of hurricane Florence hitting the coast of the Carolinas and Virginia the weekend of their wedding. Hannah, myself, and her wedding planner stayed in constant communication over that entire week debating whether or not we would have to cancel the wedding. After lots of prayer and patience, hurricane Florence shifted south and Virginia was expected to just get severe thunderstorms, wind, and some flooding. Hannah and Eric decided to have their wedding day as scheduled and just work around the weather. Hannah and I worked together to develop several different options for photos on the wedding day with the expected rain. As much as we didn’t want to admit it, we both were going into Saturday expecting the worst. Saturday came and the weather predictions were looking better than they did earlier in the week, but still not great. When I arrived at Diamond V Farm the skies looked cloudy and gloomy, but it wasn’t raining! I just kept praying that the weather stayed exactly like that, so that Hannah and Eric could have their ceremony outside and we could get some portraits outside. We were all check the weather and the radar incessantly all day watching for when the rain was supposed to start. The radar kept showing that rain was coming all day, but somehow it never once showed up; it was a miracle! I don’t know how or why but it did not rain at all during the day except a slight mist once earlier in the day. All of us kept joking and saying that love drove a hurricane away, but I truly feel like it did! 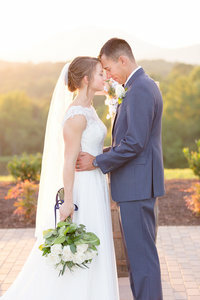 Hannah and Eric were able to have their dream wedding on Saturday, despite all of the crazy weather that was expected. 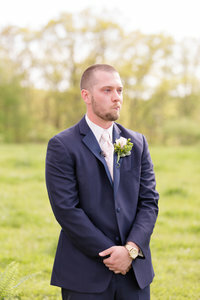 Here are my favorite photos from Hannah and Eric’s wedding day at Diamond V Farm. I hope you love them as much as I do! These shoes! All the love for Kate Spade! These girls are so funny! I loved hanging out with them all day! Hannah’s mom gifted Hannah with her grandmother’s handkerchief. So sweet! How precious is Hannah’s dad and his reaction!? These floral arrangements were absolutely stunning! I love all of these bright colors. I cannot get over how stinking cute they are! The cutest ring bearer of all time! I have never in my life seen two cuter kids! They’re precious!! Ashley, the owner of Diamond V Farm, brought out her horse, Torque, to hang out with us during portraits. We were all a little too excited! Isn’t he so cute!?! Hannah is STUNNING! And how handsome is Torque?! These two are constantly smiling and giggling when they’re together. It’s so cute! I was SO excited that Hannah had a cathedral length veil! Give me all the long veils! Pure wedded bliss! These two are so in love! By far the BEST cake smash I’ve ever witnessed at a wedding! These guys know how to party! The reception was so much fun! I was so excited that Hannah and Eric were down to do a night portrait in Diamond V’s gorgeous arbor! Hannah and Eric, thank you guys so much for trusting me to capture your wedding day! You guys are both so sweet and fun to be around. I love you both and wish you nothing but pure happiness together! A HUGE shoutout to the amazing vendor team!